It was the day of my first 10k (6.2 miles) and my first road race I ran by myself (several months after my sister and I completed our marathon together, we walked the whole marathon - maybe a story for another day). I was feeling pretty good about my fitness and was excited for this new challenging distance. I reviewed the course map and saw that there was a water station every mile. I decided that I could probably run 6 miles with a short walk break at every water station with a solid .2 mile ‘kick’ to finish it off. Up until this point the most I had ever run in one stretch was 1 mile, and even that was a challenge. All my training had always been run/walk in short intervals, run 5 minutes/walk 2 minutes, that sort of thing. So I knew this was going to be difficult, but I thought I could do it! My plan was set! I showed up at the start line ready for the challenge! I was well rested, hydrated, had a small breakfast in my tummy and full of excitement! I lined up towards the back of the pack, and when the starting gun went off I was swept away in the energy of it all! Off I went at my trot of a run. Breath in trot-trot-trot, breath out trot-trot-trot, in trot-trot-trot, out trot-trot-trot. I found my rhythm and was on my way, enjoying the day, the other runners, the energy. I passed the first mile marker - water station must be just ahead. In trot-trot-trot, out trot-trot-trot. Felt good, a bit of a breeze, what a great day! In trot-trot-trot, out trot-trot-trot. And then there it was, mile marker 2 with the water station just beyond! It sure didn’t seem like I had run 2 miles but there it was, clear as day, mile marker 2! How did that happen!?! I took my walk break at the water station and decided to try run to the next one another two miles out. I did it again! What?!? Who is this person? I ran another mile, feeling strong and decided to take a short walk break so that I would have the energy to pick up the pace in the last mile and really kick it in high gear for the final .2 . I passed a ton of people in that last 1.2 miles. I finished strong! 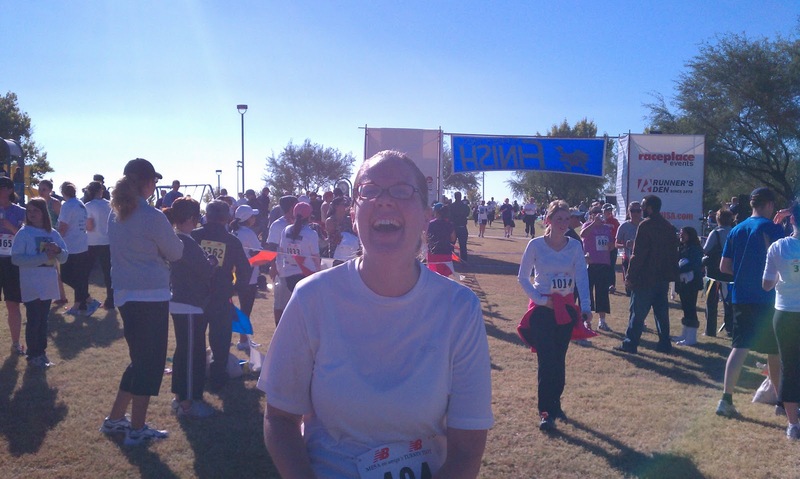 Not stumbling, not at a shuffle of a walk, I was going all out across the finish line and feeling great! I finished that race in 1:22:31 not an amazing time by any means, but it felt amazing to me! Running two miles straight really isn’t much, and it’s not as if I had in my mind that ‘once I run two miles straight then I know I am a real runner’. But before this I didn’t even think I could run two miles straight. It didn’t even occur to me to try. I had made my race plan thinking it would be my biggest challenge yet. I thought running the race with short walk breaks every mile would have been an awesome success! I had in my mind what I was capable of, and yet remarkably and unexpectedly that day I just tipped right over that perceived boundary. I guess I'm kind of still waiting for that "I really feel like a runner" moment.... not sure it will come. I might not be a runner! But that doesn't mean I can't walk/run a few races here and there, right?? Maybe I'll get there. It is a good feeling the day you realize you are a runner. Keep it up Jennefer!